Our Coded light cameras are designed for short range indoor applications. Coded light offers affordable depth calculations with our onboard 3D imaging ASIC. Coded light projects a known pattern onto a scene and evaluates how this pattern deforms on surfaces. These patterns also vary over time, enabling finer detail to be composited from multiple depth images. Through deformation analysis, vision systems calculate the depth and surface information of objects. 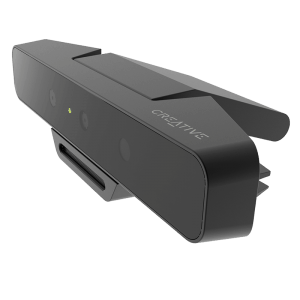 Applications include: face analytics and tracking, scanning and mapping, scene segmentation, hand and finger tracking and desktop augmented reality. Designed for short range gesture recognition and control, our previous generation Intel® RealSense™ depth camera SR300 is an excellent affordable way to get started with depth development. Optimized for indoor and short range usage, the SR300 supports our latest Intel® RealSense™ SDK 2.0. The Intel® RealSense™ depth module SR300 is a subassembly product built on a short-range, coded light 3D imaging system. With a broad range of 3D mode configurations and synchronization capabilities, the SR300 provides an optimal solution for a wide range of 3D imaging applications — particularly facial recognition. The Intel® RealSense™ camera SR300 is ideal for digital home assistant‑like products that incorporate photo capabilities. Built for gesture recognition and control, the Intel® RealSense™ camera SR300 enables interaction with both flat and multi‑dimensional displays.